New York, March 18: Was the United States complacent in its certification of the Boeing 737 MAX? That's a question everyone is asking after Addis Ababa said flight recorded data showed "clear similarities" between last week's Ethiopian Airlines crash and that of Indonesia's Lion Air five months earlier. 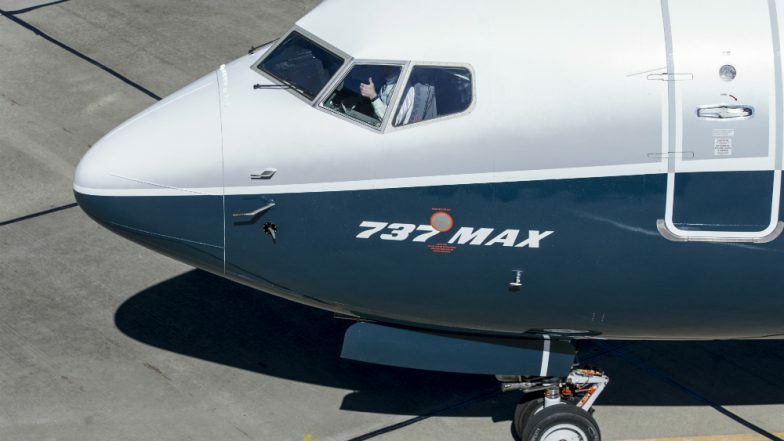 In service since May 2017, the 737 MAX 8, one of several variants of the 737 MAX, has now experienced two deadly tragedies, a scenario that is unprecedented for a new aircraft. The March 10 crash, south-east of the Ethiopian capital, claimed 157 lives, on top of the 189 who died when the Lion Air flight plunged into the Java Sea in October 2018. Investigations are ongoing but early evidence has pointed to a problem with the flight stabilization system designed to prevent stalling, the Maneuvering Characteristics Augmentation System or MCAS. Ethiopian Transport Minister Dagmawit Moges said Sunday that a study of the flight data recorder retrieved from the Ethiopian plane had shown "clear similarities" to that of the Lion Air flight. Boeing 737 Max 8 Aircraft Banned or Grounded in 50 Countries, Including US, Company Supports Action. While it may take months for definitive conclusions, experts are asking why the MCAS was green lit despite objections by American pilots who had voiced concerns with the system. The US Federal Aviation Agency (FAA) is in the line of fire because it authorizes the commissioning of airplanes. But for the past decade, it has outsourced the mission, entrusting the task to airplane manufacturers themselves and to external experts. Boeing 737-MAX Aircraft Grounded By DGCA, Days After Ethiopian Airlines Crash. Under this new program, known as the Organization Designation Authorization (ODA), employees of Boeing accredited by the FAA assist the regulator in approving the aircraft of their employer (from design, production, flight tests, maintenance and other systems) as well as signing off on the training procedures of pilots on new planes. The trend has accelerated due to budget cuts and the increasing volume of air travel, industry sources told AFP. In the case of the 737 MAX, Boeing expressed a case of urgency because of its medium-haul competition with the Airbus A320Neo that launched shortly before, the sources said. The original safety analysis that Boeing delivered to the FAA had "several crucial flaws", according to a report in the Seattle Times on Sunday. There were also strong differences of opinion between FAA staff in Seattle, where Boeing planes are built, and in the Washington D.C. headquarters, a government source told AFP. The agency defended itself Sunday, telling AFP in an email: "The 737 MAX certification program followed the FAA's standard certification process." Dennis Muilenburg, Boeing's CEO, said Sunday the company was finalizing a software update to the MCAS. Industry sources indicated to AFP it would be ready in about 10 days. Peter DeFazio, chairman of the House of Representatives' Transportation and Infrastructure Committee, is planning to launch an investigation into the 737 MAX's certification, Congressional sources said, adding that public hearings have not been ruled out. "The FAA's credibility is really on the line here, as is Boeing's. And, the global system of aircraft certification reciprocity is at risk too," said Richard Aboulafia, an aeronautical analyst at Teal Group. Following the Lion Air crash, the FAA asked Boeing to modify its flight manuals and pilot training so they could recognize and respond to unexpected maneuvers initiated by the MCAS. The 737 MAX was certified as a variant program of the its predecessor, the 737 Next Generation, despite major differences in the engine and the MCAS, according to documents available on the FAA's website. In a nutshell, the plane was not examined in its entirety.